In the short term, farm dwellers need to address the most pressing issue they face: farm evictions. At this moment, they cannot afford to wait for the Constitution to be amended nor any legislation be strengthened. Because of this, land occupations and resistance to evictions are so critical, particularly in the Western Cape, where over 20,000 people are threatened by farm evictions. To halt farm evictions, civil society must invest resources towards countering power with more coordinated resistance and solidarity. Through action, change emerges. In 2012 during protests against low wages and poor living conditions, South Africa witnessed a wave of burning fields, demonstrations and clashes between police and farm workers. Today, meaningful interactions between citizens and government officials, farm dwellers and farmers in this instance, continues to only result from resistance, protests or demonstrations. Norman Nel, a farm dweller at Houtkloof in Wellington, is threatened with farm eviction. Since 2011, the farmer has provided him with an accommodation in a hovel that was used to accommodate doves. His family later joined him on the farm and were given another shed to live in. Nel’s employment was terminated or “retrenched” in 2016. In January of this year, the farm owner demolished the shed that Nel shared with his son. They had to move to the other small shed used by his wife, daughter, and two grandchildren. Their belongings are outside – exposed to the natural elements. Although the living conditions are less than ideal, they do not have anywhere else to go. Nel’s experience is not an isolated example. In Simondium, about hundred families have received letters to vacate Marlenique farm – a common thread in rural South Africa. 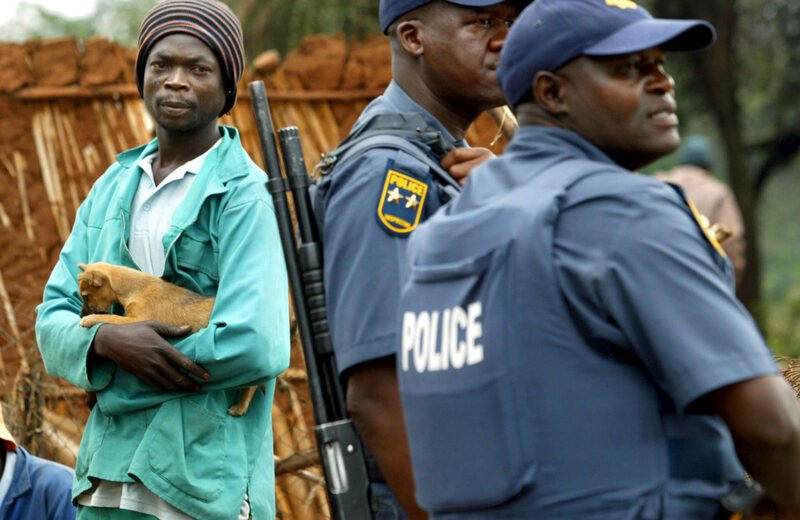 Recently, Women on Farms Project(WFP) and the Human Rights Commission in the Western Cape highlighted a significant increase in illegal evictions from farms. In the plight of the evicted farm-workers and their families, wider issues of exploitation and of powerlessness are exemplified. An eviction notice means more than simply the loss of a job, serious as that may be; it also means the loss of a home, of access to land, of security, of a way of life, and indeed, perhaps of life itself. In a Facebook post, the WFP reported the burned out remains of a 16-year-old girl – Deoline Demas – were found at a dumping site. Her family used to live in Soetendal farm in Wellington until they, including 23 farm worker families, were evicted from the farm. “They were all ‘dumped’ in shacks in a drug and crime-ridden shack land in Wellington,” they said. It was from there that Deoline went missing and her remains found burnt. “…But we are most angry at the state-sanctioned evictions which led to Deoline and her community being evicted from a farm where they had lived in safety for decades. If Deoline and her family had not been evicted and were still living on the farm, she would still be alive today,” concluded WFP’s post. Stories about dwellers losing their homes, land and livelihoods are common in contemporary South Africa. The experiences of farm dwellers described above speak of structural inequalities created through a long history of conquest, dispossession and uneven development. The continuing legacy of agriculture in South Africa as it relates to the well being of farm dwellers presents us with contradictory perspectives. Agriculture as one of the largest wealth contributors in the country significantly developed South Africa into one of the leading economies in Africa, also contributing to our food basket. However, industrial agriculture has also caused considerable destruction to black communities and sowed divisions between white and black populations. The context of farm dwellers or former labour tenants’ dates back to colonial labour system that forced black landowners to become tenants on their own land but also, in parts of the former Cape colony and the old Boer republics, as slave labour. Individuals and families had to earn their tenure, by their labour, on land that was handed to whites. Under this land dispossession and labour exploitative system, farm dwellers have clung to the scope it offered: chiefly, to keep cattle and plough. However, from the 1960s, the apartheid government – in conjunction with organised agriculture – launched a drive to eliminate labour tenancy throughout South Africa and to replace it with a system of reduced, full-time farm labour. Amongst others, the chief reason being the promotion of more capital-intensive agriculture. During this period, districts were declared non-labour tenants’ areas; farm dwellers not willing to switch to full-time labour tenancy were evicted. However, the transition was not smooth. Resistance has always been a significant feature of the South African socio-economic landscape. Land dispossession and the elimination of labour tenancy were not achieved without resistance. Farm dwellers have a recorded history of clinging tenaciously to the only system of land tenure they know. This was the case in evictions in KwaZulu-Natal in the 1960s, households who had lived on farms for generations; they could point to family graves, their records of ties to settlement, cultivation and family history that were far more binding to them than a mere title deed, a piece of paper that many could not even read. They refused their eviction notices and had to be driven off by police and farmers, who came with dogs and guns and fire, burned down huts, impounded cattle, and arrested the people still living on the land. However, such resistance was localised – often individual and spontaneous, reacting to a crisis as it hit. Still the case today, there are no farm-dweller organisations at a national level to take up the struggle on a wider basis to lobby on behalf of those being evicted and mould them into a united group. Local tenant opposition could succeed in delaying the evictions; it could even, perhaps, win concessions wherein tenants would be resettled; it would not, however, prevent evictions when the local farmers and local authorities have decided on enforcing them. Today, to resist farm eviction, dwellers should continue occupying and practising minimal acts of sabotage against individual farmers’ property as overt signs of opposition, on the basis that they have rights to land that they currently occupy – informed by the redistributive elements provided in the Labour Tenant Act (LTA) and the Extension of Security of Tenure Act (ESTA), including the Interim Protection of Informal Land Rights Act (IPILRA). The redistributive element encompassed in ESTA and LTA laws sought to provide a means of upgrading the rights of occupiers to full ownership by providing them with a portion of land that they use to live on, grow crops and keep livestock. The persistence of farm evictions and human right violations on farms betrays these envisaged rights. Therefore, farm dwellers should resist evictions until they are recognised as both de jure and de facto property rights owners at legislative and statutory levels translated in tangible meaning. We need more than superficial reform in agriculture, a radical programme that removes the sector from private corporations, political elites and the dictates of the market. And, remove land use and holding from private ownership. Though this long-term solution will not be realised under existing political and economic structures, a mid-term solution is a civil society supporting grass roots driven resistance because it is the experiences and interests of ordinary citizens that should inform laws and policies for development.